Enterprises are under attack. Any business that depends on the Internet is a target for distributed denial-of-service (DDoS) attacks, which overload a network and its components, effectively shutting down the network. These attacks are more than an inconvenience — they can harm an organization's reputation or, worse, cost lots of money in lost customers, revenue, and data. This Technology Spotlight describes DDoS attacks and their rise in the business market. After a discussion of the costs of these attacks and current mitigation solutions, this paper examines Arbor Cloud, a DDoS service from Arbor Networks. 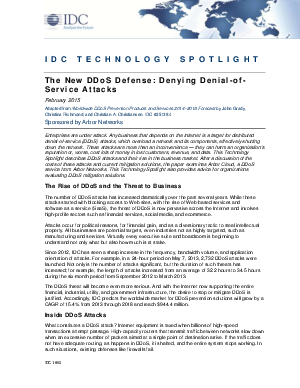 This Technology Spotlight also provides advice for organizations evaluating DDoS mitigation solutions.